Since the introduction of Community Led Total Sanitation (CLTS) in the West and Central Africa region in late 2009, most countries have adopted CLTS as one of the recommended approaches for rural sanitation. More than half of the countries in the region are now implementing CLTS at a significant national scale while the remaining countries continue to implement at a project scale. 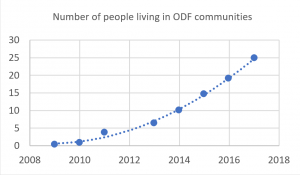 In 2017 alone, UNICEF recorded more than six million additional people living in ODF certified communities in the West and Central Africa region, reaching the highest number recorded (24 million) since the start of certification in 2010. Nevertheless, to end open defecation (OD) by 2030, 183 million people also need to gain access to improved sanitation facilities, which represents about 12 million per year. So, in addition to much-needed scaling up of efforts, past gains necessarily need to be maintained to envisage reaching the SDG’s target of ending OD by 2030. Recent studies indicate that slippage in the region ranges from 40 per cent to eight per cent depending on countries. It should be noted that there is no wide consensus on the definition of slippage. Some studies consider maintaining all ODF certification criteria, while others focus on latrines coverages and use. During the exciting discussion on sustainability that we conducted through a ‘Fish Bowl’ exercise, participants were eager to share their experiences on post-ODF activities. Most of the activities that were shared targeted the improvement of enabling conditions referring to institutions and processes. It was interesting and encouraging to note that in the last three to four years most countries have started developing post-ODF interventions, some documenting them in national documents. Participants mentioned the involvement and capacity building of decentralised authorities (e.g. municipalities and districts) as critical for sustainability, but they admitted that despite advocacy and training/capacity building efforts, lack of human and financial resources hindered their ability to takeover post-ODF follow up. In addition, extension workers from other sectors (health, nutrition and education) are often over-stretched and cannot take on extra duties. Mauritania mentioned the high cost of external monitoring visits. To address the high cost constraint, communities implemented self-evaluations in at least three countries (Niger, Mali and Mauritania) with evidence of household hygiene behaviour improvement at pilot stage in Mauritania. Local sanitation groups and other community members groups (such as women’s groups, institutions and schools) were trained to further promote hygiene practices. At national level, the participatory development of a national road map/costed plan to reach ODF (Mauritania 2020 and Mali 2024) was mentioned as a good tool to take stock of the country sanitation situation and established consensus on the way forward. Many participants also mentioned that annual reviews and knowledge sharing workshops are useful tools to help increase harmonisation of approaches. A few participants shared activities targeting the creation and maintenance of new social norms such as the use of traditional leaders, pledging of communities’ members and communities sanctions to reinforce expectation of latrines use. However, participants felt this area was not currently sufficiently explored and behavioural science and social norms theories were not sufficiently used. Despite the excitement created by the experimentation of a wide range of interventions, the lack of data on cost, scale and effectiveness made it difficult for the interventions to be replicated, compared or ranked. My key learning from the sustainability session is that a lot is happening in the region for post-ODF, but further evaluation and better documentation is needed to ensure effective sharing of best practices, and new thinking is needed to support behaviour change. Following the session on enabling conditions and behavioural/social sustainability I facilitated one of the groups in the session on ‘safely managed sanitation’. In the activity participants defined what safely managed sanitation means in rural areas in their country, also what the challenges are and what possible existing options and solutions are available. It was very interesting and slightly surprising for me to note that the four groups discussing the same topic had very different discussions, reflecting the complexity of the subject and the difference in understanding of the concept. Some groups focused on the Joint Monitoring Programme for Water Supply and Sanitation (JMP) definition of safely managed sanitation and how it could be reached in rural areas while others discussed mainly technological options such as EcoSan and Faecal sludge management. In the West and Central Africa region, only a couple of countries (Niger and Senegal) have data on safely managed sanitation. I was impressed to observe that most participants in the session demonstrated great knowledge of the JMP definition of safely managed sanitation: defined as the use of an improved sanitation facility, which is not shared with other households, and where excreta are safely disposed in situ or transported and treated off site. During the discussions however, several participants associated safely managed sanitation with durable facilities (in cement or bricks, ventilated improved pit latrines (VIP)) even though in my opinion more durable latrines can often lead to the excreta not being safely managed (non-secure emptying and dumping in the field or in water bodies). For rural areas without high water tables and space challenges, the closure of full pit latrines and the construction of a new pit is a more simple and secure solution. In this case, reaching safely managed sanitation from ‘Basic Plus’, (a JMP term meaning basic sanitation plus handwashing facilities with soap) could be achieved through the provision of technical advice. Numerous challenges remain in the West and Central Africa region for reaching universal access to safely managed sanitation, especially in peri-urban, congested areas and areas with high water tables or a rocky soil. Technical solutions to these challenges have yet to be identified, tested and documented. The deliberations in the session demonstrated that faecal sludge management will be part of the solution. It is suggested that rural sanitation specialists should work closely with their urban colleagues to detect solutions that could be applicable to their rural context. Spending the week with sanitation specialists from the region reminded me once again of the high level of dedication and commitment of governments, NGOs, research institutes and United Nations staff working to improve the sanitation situation of children, women and men. The road to end open defecation in the region is still long and challenging; in addition to strong political, financial and human resources at national and decentralised levels we will need a strong knowledge management mechanism. This workshop is a good start, it will feed into the upcoming sub-regional and regional AfricaSan meeting, in which more learning and sharing across the region and continent will take place.